Man-made or ‘‘synthetic’’ diamonds have been available for many years, but to date have predominantly been used to manufacture smaller diamonds for industrial purposes; it is estimated that ca. 15 billion carats of industrial synthetic diamonds are produced annually (source: Ehud Laniado). Their manufacture involves the use of very high temperature and pressure techniques that render the synthetic stones generally uneconomic for larger gem-quality stones. China is by far the largest producer of synthetic diamond and accounts for ca. 90% of global production. Technological advancements mean that gem quality synthetics are now more widely available but they are still only estimated to represent ca. 3% of mined diamond supply (source: Canaccord Genuity – Quarterly Diamond Focus – August 2017). As technology advances it is possible that a larger market for the use of synthetic diamonds in jewellery could develop but also that their cost of production will continue to decline, further eroding the tenuous value proposition of an industrial product that can be mass produced (in contrast to the inherent rarity of natural gem-quality diamonds which were formed in the Earth over a billion years ago). Based on the precedents of other synthetic versus man-made gemstones (synthetic emeralds, rubies, sapphires and farmed pearls are all readily available), the Company expects synthetic diamonds to find a place in the consumer market as lower value goods, with natural diamonds remaining the premium product. Identification and appropriate classification is key to ensure that customer confidence in natural diamonds is not eroded, and equipment has been developed that is able to detect synthetics with 100% accuracy, thus reducing the substitution threat. Industry organisations such as GIA are increasingly testing and providing certification services. Synthetic diamonds are also required to be separately certified, a key industry control, which helps cement consumer confidence in the industry. 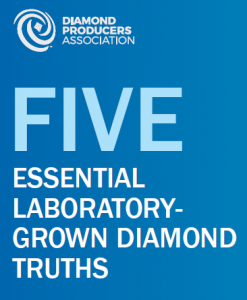 The Diamond Producers Association is tasked with helping consumers to understand the significant value differential between natural and laboratory-produced diamonds.